Mickey’s Christmas Carol’ is one of countless cinema versions of Charles Dickens’s classic tale, this time using Disney characters. Star of the film is Scrooge McDuck, which of course comes natural to the old miser as the character was actually named after Dickens’ main protagonist. Unlike the other characters Scrooge McDuck was mainly a comics hero, created by Carl Barks, and he had appeared on the screen only one time before, in the educational film ‘Scrooge McDuck and Money’ (1967). However, only four years later he would be animated extensively, in the highly successful televison series, Ducktales. Most people however will remember ‘Mickey’s Christmas Carol’ as Mickey’s return to the screen for the first time since his retirement in 1953. 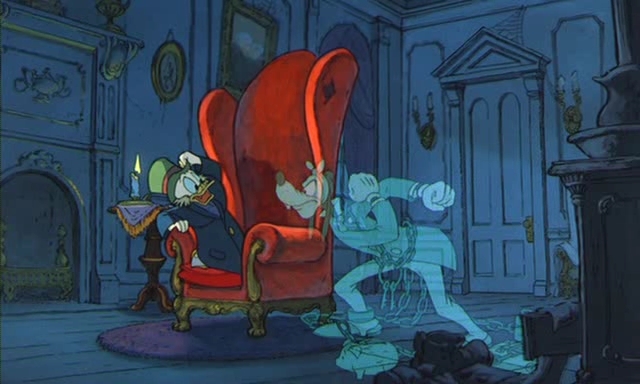 But it also marks the return of Donald (as Scrooge’s nephew Fred) and Goofy (as his former partner Jacob Marley) to the screen after a 22 year absence. The film has an all-star cast in any case, reviving many other classic Disney stars, like Jiminy Cricket (as the ghost of Christmas Past), Daisy (as Scrooge’s former love interest) and Pete (as the ghost of Christmas future). Also featured is Willie the giant from ‘Fun and Fancy Free‘ (1948) as the ghost of Christmas present, and several characters from ‘The Wind in the Willows‘ (1949). Apart from these we can see glimpses of the Big Bad Wolf and the three little pigs, Clarabella Cow, Horace Horsecollar, Huey, Dewey and Louie, Minnie Mouse and some characters from ‘Robin Hood‘. This all-star cast gives the film a nostalgic feel that fits the story. Indeed, with hindsight, one can see ‘Mickey’s Christmas Carol’ as an early example of the Renaissance that was about to happen, in which the classic cartoon style was revived after ca. twenty dark years. ‘Mickey’s Christmas Carol’ is no ‘Who Framed Roger Rabbit?‘, however, and it only looks back, not forward. For example, the rather uninspired score is by Irwin Kostal, who had been composing for Disney since ‘Mary Poppins’ (1964). Moreover, the film’s design, using xerox cells and graphic backgrounds, is firmly rooted in the tradition of the 1960’s and 1970’s. ‘Mickey’s Christmas Carol’ is a nice and entertaining movie, but it would take another five years for the Renaissance hitting Disney in full glory, with inspired and innovative films as ‘Who Framed Roger Rabbit’ (1988) and ‘The Little Mermaid’ (1989). My favorite animated version of ‘A Christmas Carol’ (although it’s not particularly good) is a 1997 version with Tim Curry as Scrooge.